MADE FROM NATURAL INGREDIENTS: Made from India's natural and traditional skin care herb called Neem, well-known for its purifying and antibacterial properties, kills problem-causing bacteria. Combined with Turmeric, it helps control acne and pimples. This time-tested combination of Neem and Turmeric purifies your skin, leaving it clean, nourished, silky soft, and radiant. 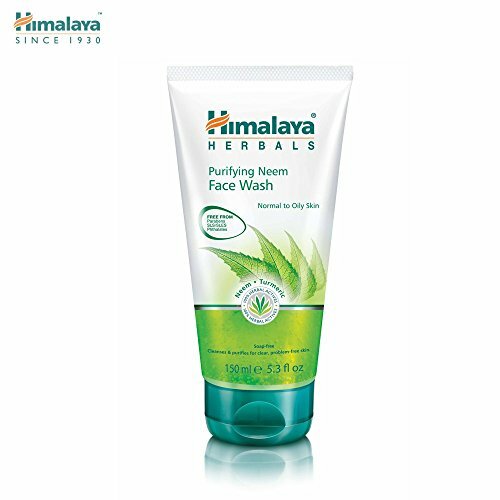 SOAP-FREE HERBAL FORMULATION: Himalaya Neem Face Wash comes without the presence of soap, as it dries your skin which leaves you irritated and dissatisfied. It is a smarter, cleaner, gentler choice to soothe, nurture, purify and protect your skin. HELPS CONTROL ACNE AND PIMPLES: Dermatologically tested and enjoyed by all, with its antibacterial properties it gently removes all skin impurities, and prevent the recurrence of acne and pimples, ideal for normal to oily skin. FROM SLS/SLES AND PHTHALATES: Sodium Laureth Sulfate (SLS) is a well known ingredient that causes skin irritations (used in soap as foaming agent), while Phthalates can cause even more harm on your skin due to its plasticizing properties (used in nail polish, and others). Himalaya Neem Face Wash has been made without the presence of these harmful chemicals that might cause irritation and harm in your sensitive skin. Purifying Neem Face Wash is a soap-free herbal formulation that gently removes impurities and prevents pimples. Enriched with Neem and Turmeric. Neem , well known for its antibacterial properties, helps in controlling acne and pimples, and their recurrence. Further, when combined with Turmeric , it effectively eliminates acne-causing bacteria.